A protective plate that surrounds the keyhole of a door or door handle. 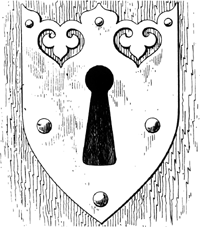 An ornamental shield, flange, or border used around a dial, window, control knob, or other panel-mounted part. Also known as escutcheon plate. 1. A protective plate surrounding the keyhole of a door, a light switch, etc. ; also called a scutcheon. 2. A flange on a pipe, used to cover a hole in a floor through which the pipe passes. 3. A protective or ornamental cover at the termination of a post, picket, or rail against a tread, floor, or wall.